It’s exciting creating a new bathroom but whether you’re revamping your bathroom or stripping out and starting again, it’s important to spend time planning your bathroom space. To help create your ideal bathroom retreat, here are our top five design tips. Look at your layout – First things first, look at your layout. What do you want from your new bathroom? More space to move around? Stylish storage solutions to de-clutter? As well as taking careful measurements, make a list of your bathroom wants and needs. If you’re keen to open up a small bathroom, wall-mounted basins and WCs are ideal for creating more floor space. Or if you’re considering a complete re-fit, think about ways to enhance your environment. For example, installing a shower enclosure and a bath, or replacing a fitted bath with a free-standing one. As well as giving you more floor space, a free-standing bath adds a splash of luxury. Define your style – There are hundreds of different styles of bathroom to choose from, from classic designs to cutting-edge suites. Again, think about what you want from your bathroom? Do you crave a luxury hotel feel, complete with extra deep bath for soothing soaks, or a generous shower room to invigorate at the start of the day? If you’re a growing family, would a dedicated shower bath make bath times easier? Once you’ve defined your needs, think about what bathroom style you like and what will complement the style of your home. Pinterest, home magazines and our luxury bathroom showrooms are good sources of inspiration. The Details – From the flooring you choose, to the shape of the wall tiles, the smaller details can make a real difference to the final finish of your bathroom. Innovative vinyl flooring, such as Amtico, looks great and is ideal for family bathrooms as it is non-porous. Whilst porcelain and ceramic tiles on floors and walls can be used to stunning effect – especially in a shower room - and usually come with anti-slip technology. If you crave a wood flooring effect, take a look at Villeroy & Boch’s wood grain tiles which combine the beautiful appearance of wood with the hard wearing quality of a tile. When it comes to decoration, white and cream will make a room feel more spacious, whilst darker, earthy shades of brown, blue and grey will make crisp, white ceramics stand out. Lighting – Lighting can have a huge impact on the final look and feel of your bathroom. To make a cramped bathroom appear bigger, LED illuminated cabinets and bathroom mirrors not only reflect light – creating the illusion of space - but are super stylish to boot. The most effective overhead lighting for a bathroom is recessed LED spotlights, which also work best for highlighting different bathroom features. To aid relaxation, consider installing a dimmer switch. Storage – It’s hard to power down if you’re surrounded by lotions, potions and an overflowing bin. To give your bathroom a clean, minimalist feel, internal storage solutions are the way forward. Look for bathroom furniture that offers discreet storage, such as, wall-mounted vanity units or surface-mounted basins with cabinet space below. If you’re renovating, think about creating recessed storage in the shower or bath area with an in-built niche. As well as extra space, these are ideal for displaying your favourite products. Thinking about changing your bathroom? 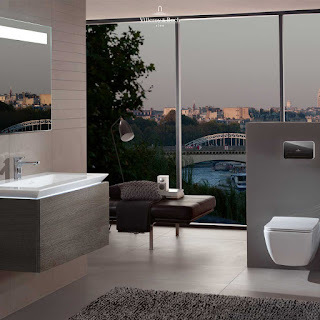 European Bathrooms make designing, choosing and installing new bathrooms easy. To take the first step book your free home or in-store bathroom design appointment or call in to our Amersham or Windsor bathroom showrooms.